Today, the alarm went off at 5:30! It was tough getting out of bed as the temperature was 19 degrees and the wind had been howling all night, keeping me up as the large trees just outside my window were making lots of noise as the wind roared through the branches. After putting lots of layers on I headed out. The wind was still blowing steady at about 20 MPH. (Boy that little 1991 16v VW Jetta loves cold weather! It started up just like that!) Had to shift my gear from one car to the other as I just didn't feel like getting the other car out of the garage. I met Annette and Steve at 7:00 am in White Marsh and we headed north to the Susquehanna State Park. After riding through the park along side the river and checking out our favorite spots, we saw the water was running high, which meant, no skim ice as it would be washed away. So we checked out Deer Creek for any icy formations along the banks and didn't see any in the immediate area of the parking spot; we headed back to the ponds by the mill. Boy it was cold! The ponds were a little less than clear from the snow we had a couple days ago, but there was some material to work with. We bundled up and got our gear set. We did some steady shooting for an hour and a half before calling it a morning. We were, hungry, cold and ready for some coffee! 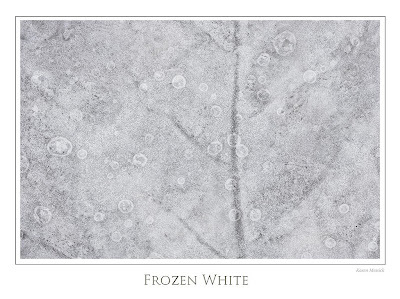 Frozen White is an overlay of two images. 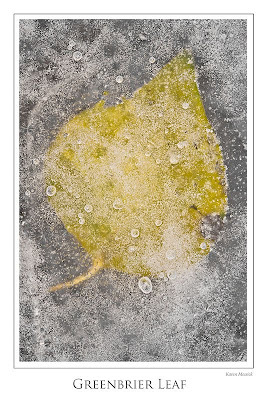 There was only one completely frosted frozen under ice white leaf and I got the idea to just make a white image as it really reflected the cold of the day. 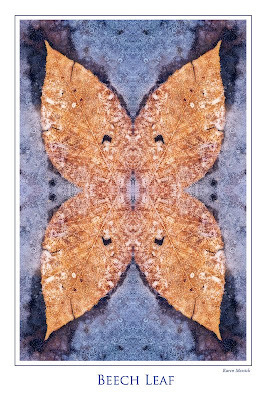 Beech Leaf is a "Quad Mirror" image, that's one image mirrored twice in PS. Greenbrier leaf is pretty much a straight shot with a touch of Topaz Adjust. 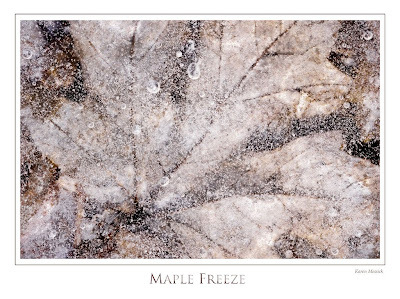 Maple Freeze is a slide sandwich that's a layer of screen a layer of multiply with some Gaussian blur or something like that...."A La Tony Sweet" Check out his Visual Artistry DVD the PS action is demonstrated there! I thought I'd give it a try and see how I liked it..and there also is some selective color adjustments in PS. 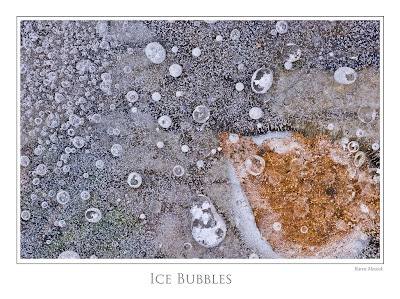 Ice Bubbles is also a pretty straight shot, with some Topaz Adjust..
now it's Ravens Time! We better win this one! Oh and the last shot was made by Steve Harman of the Girls on the icy pond, with our Nikons pointing straight down...this ice work is back breaking. Thanks Steve! Thanks Barbara, yes, you do have to hunt for these and then only when the conditions are just right, which is not often around here. Thanks for checking out the blog.